Farrar, Straus and Giroux (BYR), 9780374399078, 40pp. Emma has never been to a circus, so she is especially excited to see a circus parade in town. But her father says she can't go and see it—they have to get their farm ready for winter. So instead...the circus comes to her! 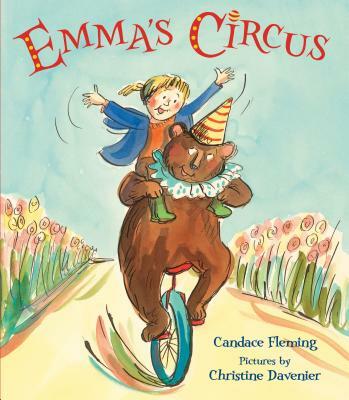 This playful, imaginative tale from Candace Fleming will have readers smiling and joining in the fun of Emma's amazing circus. Candace Fleming is the author of Giant Squid, an ALA Notable Book and Charlotte Zolotow Honor Book, and numerous other books for children. She lives in Oak Park, Illinois. I have always been a storyteller. Even before I could write my name, I could tell a good tale. And I told them all the time. As a preschooler, I told my neighbors all about my three-legged cat named Spot. In kindergarten, I told my classmates about the ghost that lived in my attic. And in first grade, I told my teacher, Miss Harbart, all about my family’s trip to Paris, France. I told such a good story that people always thought I was telling the truth. But I wasn’t. I didn’t have a three-legged cat or a ghost in my attic, and I’d certainly never been to Paris, France. I simply enjoyed telling a good story . . . and seeing my listener’s reaction. Sure, some people might have said I was a seven-year-old fibber. But not my parents. Instead of calling my stories "fibs" they called them "imaginative." They encouraged me to put my stories down on paper. I did. And amazingly, once I began writing, I couldn’t stop. I filled notebook after notebook with stories, poems, plays. I still have many of those notebooks. They’re precious to me because they are a record of my writing life from elementary school on. In second grade, I discovered a passion for language. I can still remember the day my teacher, Ms. Johnson, held up a horn-shaped basket filled with papier-mâché pumpkins and asked the class to repeat the word "cornucopia." I said it again and again. I tasted the word on my lips. I tested it on my ears. That afternoon, I skipped all the way home from school chanting "Cornucopia! Cornucopia!" From then on, I really began listening to words -- to the sounds they made, and the way they were used, and how they made me feel. I longed to put them together in ways that were beautiful and yet told a story. As I grew, I continued to write stories. But I never really thought of becoming an author. Instead, I went to college, where I discovered yet another passion -- history. I didn’t realize it then, but studying history was really just an extension of my love of stories. After all, some of the best stories are true ones -- tales of heroism and villainy made more incredible by the fact they really happened. After graduation, I got married and had children. I read to them a lot, and that’s when I discovered the joy and music of children’s books. I simply couldn’t get enough of them. With my two sons in tow, I made endless trips to the library. I read stacks of books. I found myself begging, "Just one more, pleeeease!" while my boys begged for lights-out and sleep. Then it struck me. Why not write children’s books? It seemed the perfect way to combine all the things I loved -- stories, musical language, history, and reading. I couldn’t wait to get started. But writing children’s books is harder than it sounds. For three years, I wrote story after story. I sent them to publisher after publisher. And I received rejection letter after rejection letter. Still, I didn’t give up. I kept trying until finally one of my stories was pulled from the slush pile and turned into a book. My career as a children’s author had begun. As a young girl growing up in Tours, France, Christine Davenier loved listening to her older sister read fairy tales aloud. But she frequently found herself wondering, What does the princess’s beautiful dress look like? or How exquisite are her jewels? Christine was left to her own imagination, for the books had few illustrations. So it comes as little surprise that today, Christine embraces her career as an illustrator. “I’m thrilled to have the opportunity to create the illustrations I dreamed about seeing as a child,” she says. She has illustrated many picture books, including Sally Jean, the Bicycle Queen by Cari Best. She lives in Paris, France.